This one has been a while in the making. 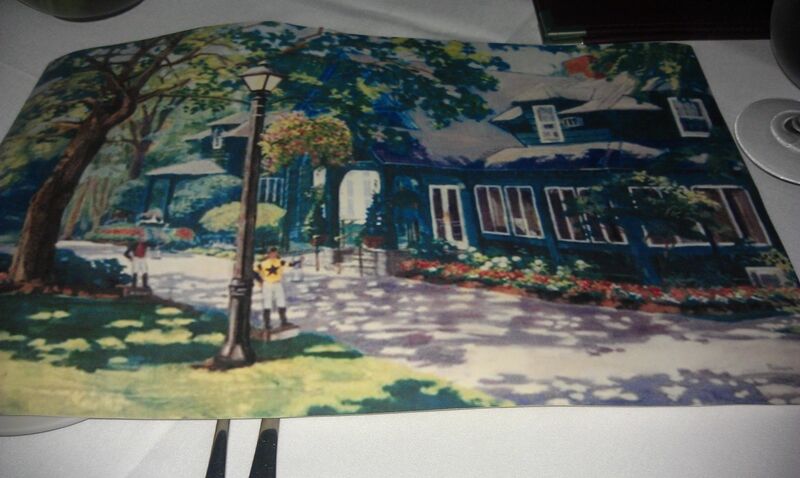 You’ll recall that I won an award from Kristi Barlette’s On the Edge Blog late last year. I was voted the biggest capital region booster in a contest where Kristi’s readers emailed in a ballot and specifically name people. Seeing how I edged out ahead of an esteemed business owner, Matt Baumgartner, who does a lot for the community, I was a little surprised. But then, I realized it was looking for the biggest, and I’m definitely fatter than Matt. I guess sometimes it pays to be a fat slob. 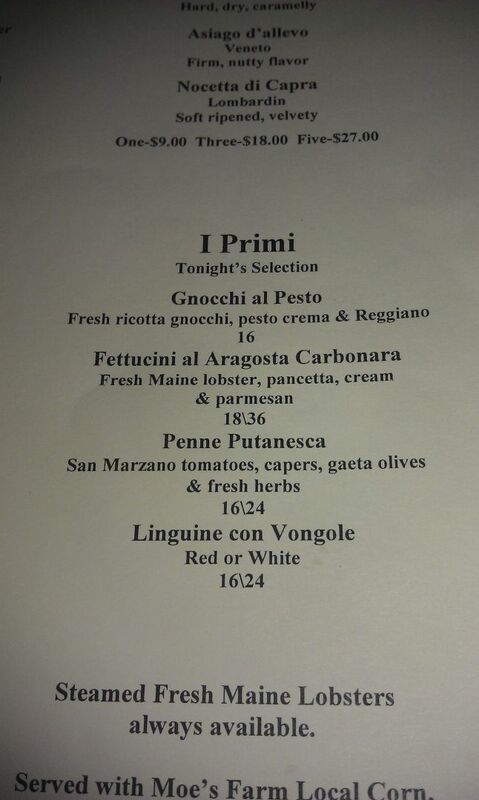 Finding no information on the menu online, I had no idea how far the $100 would get me. I made a reservation on OpenTable.com for 8:30pm on a Saturday evening. It was the only time I could select for my reservation. 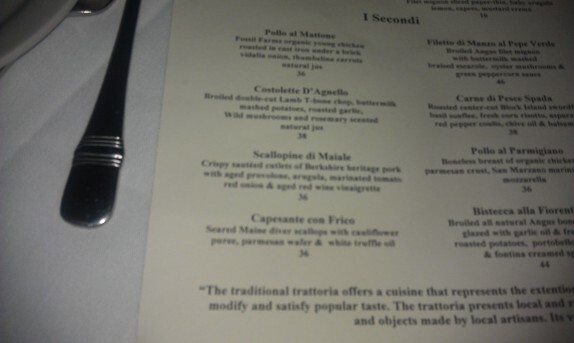 We arrived about 10 minutes before our reservation, and we had to wait about 15 minutes until our table was ready. The place was mobbed. We wound up waiting in the bar area, and it was loaded with a bunch of older age, messy drunk people. When I say older, I mean the youngest person who wasn’t me was a good 15-20 years older than me. While we were standing there, we noticed that all of the servers had to walk across the entire jam-packed bar area carrying food to serve the tables. I have to say I got a little uncomfortable with the idea that my food had to pass a bunch of obnoxious, drunken old jack wads, but sometimes, you just gotta have faith. The menu was loaded with classic Italian fare, which I pretty much assumed from the word, “trattoria” being in the name of the place. The prices on the menu were a bit on the high side, which I also pretty much assumed because it was in Saratoga and is only open during track season. 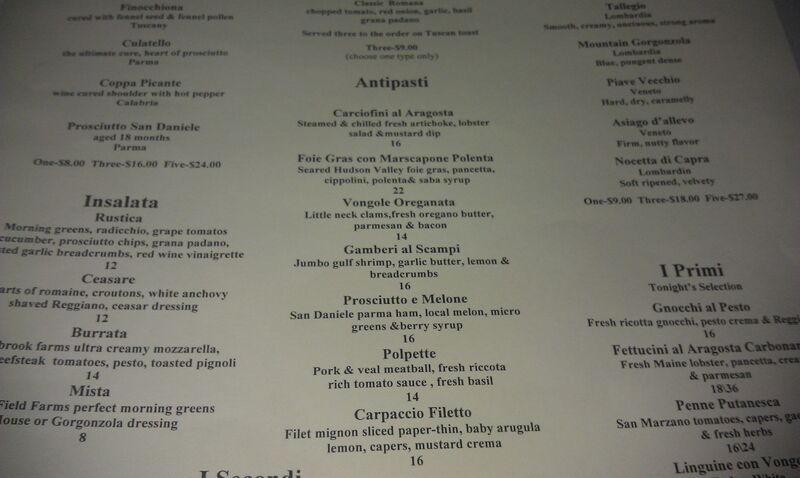 I snapped a few pictures of the menu so there’s some evidence that it exists on the internet. 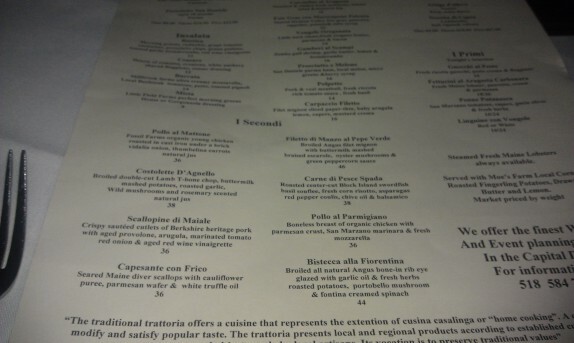 Even though the menu was so expansive and what I consider traditional, they did have a fairly interesting statement about sourcing local ingredients at the bottom of the menu. 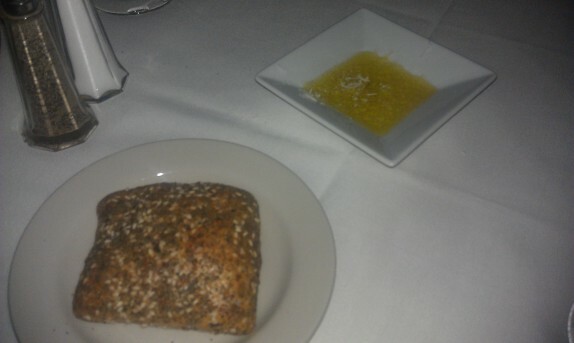 Our waiter brought us some bread and shook some ground black pepper from the pepper shaker on the table into a tablespoon of olive oil. At surrounding tables, the people were treated to freshly cracked pepper from a pepper grinder. The bread had some large bits of sun dried tomato baked into it. It was pretty decent. Both Cassie and I decided to go with a starter and a main dish. We didn’t do much with the cheese, charcuterie, salad, or pasta portions of the menu. She wanted the carpaccio filetto (filet mignon sliced paper-thin, baby arugula, lemon, capers, mustard crema – $16), which I didn’t think would be good. I wanted the gamberi al scampi (jumbo gulf shrimp, garlic butter, lemon, and bread crumbs – $16), which she didn’t think would be good. We ordered both. 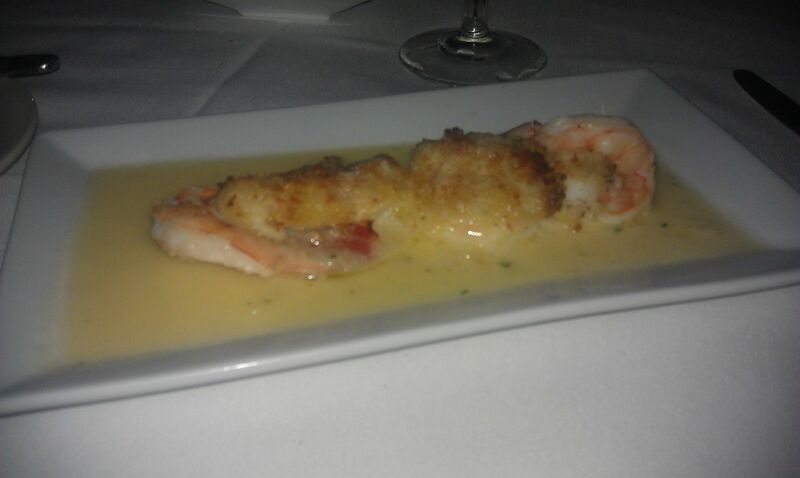 The shrimp were overcooked, under-seasoned, and were swimming in a pool of lemon butter sauce. The whole dish was not hot. The bread crumbs on top were soggy and drab. It was completely unimpressive. 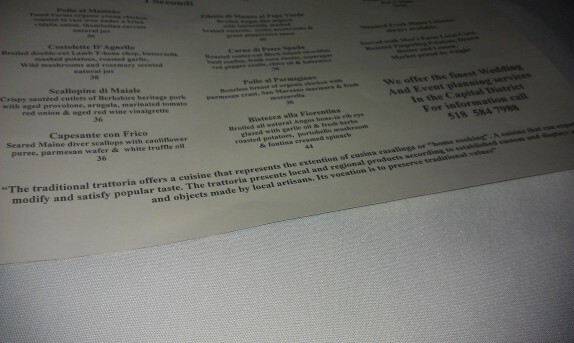 The carpaccio, on the other hand, was the exact opposite. It’s among some of the better carpaccio I’ve had. The meat was flattened just enough to leave some texture, and the beef was the star with the other components serving to accentuate the beef. It was served a little close to room temperature, and that might seem unpalatable to some, but with meat this fresh and delicious, I didn’t care. The table we had was positioned right next to a large round table, and this table was a bit of a source of frustration. The first party that was sitting there was finishing up their dinner and overindulging in after dinner beverages; they were extremely loud and physically distracting. Of course, I’m not blaming the staff at the restaurant for this, but I mention it because the next table that was seated there was even more loud and obnoxious. Looking around the restaurant, these types of people seemed to be a trend, and we were the outliers. I just kept telling myself to ignore them and focus on the food. 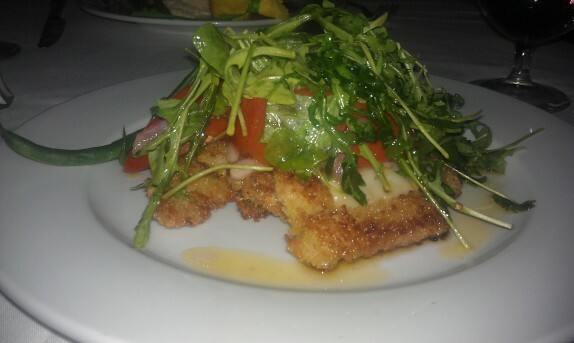 For my main dish, I ordered scallopine de maiale (crispy, sauteed cutlets of Berkshire heritage pork with aged provolone, arugula, marinated tomato, red onions, and red wine vinaigrette – $36). This dish was not bad. The pork cutlet didn’t have any salt added to it, so it came off bland in most bites. Taken with the provolone (which I’m going to wager was domestic and barely aged), tomato, and arugula, it tasted alright. I actually really enjoyed the bright red tomato that was tossed into the salad topping the cutlet. 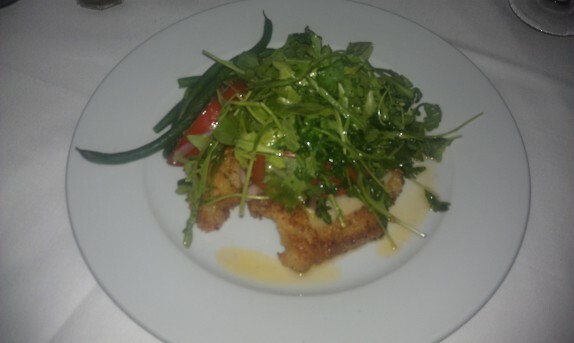 This dish was far from worth $36, though, but overpriced meals in seasonal places in Saratoga are common. It was getting pretty late, but we were both pretty unfulfilled, so we kept flip-flopping on whether to order dessert. The table next to us was getting louder and more obnoxious, so we kind of wanted to jet, but we also wanted something to cap off the meal. We finally decided to order dessert. I got tiramisu. Honestly, nothing else on the list sounded appealing to me. 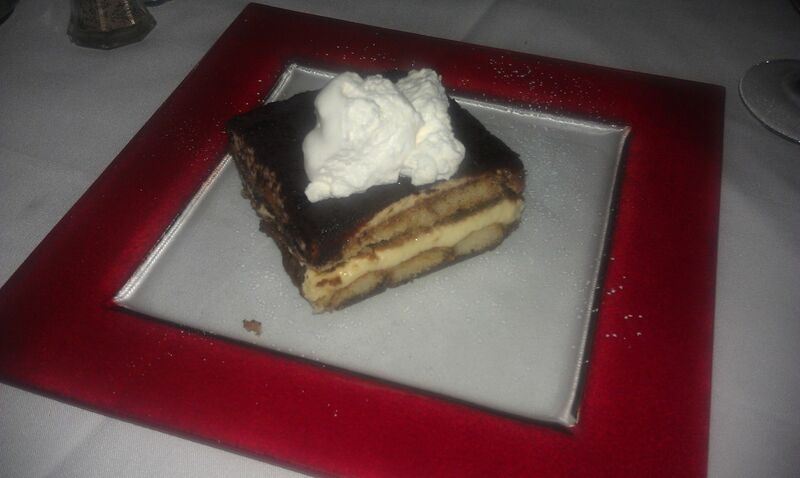 I enjoyed the tiramisu ($10). The texture was right on, and the marscapone cream was perfectly crafted and not muddied with heavy cream. The kid came back with the bill, and we handed him the gift certificate and a credit card to cover the remainder of the balance, and I quickly walked out to get the car while Cassie waited to sign the receipt. While I realize I’m not high on this place, I can’t say it’s all bad. 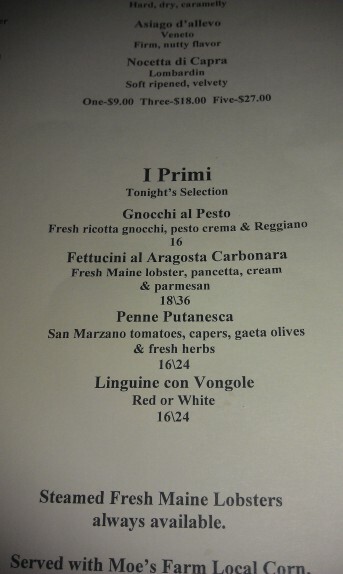 You may pay a little much, but this will fulfill any cravings you have for traditional Italian fare. It’s also a great place to drink if you’re in your 50’s, and you like loud and obnoxious places. $36 for chicken parm! Holy cow! That would have to be one kicka** version of the dish to be worth it. Based on your description of the atmosphere, doesn’t seem like a place I would want to eat even with a $100 gift certificate. Then again after a couple of cocktails it could become more entertainment than annoyance. Lol. Glad you took the bullet on this one. I don’t see myself dining at Siro’s Lodge any time soon, or later.